One path that Apple could take if it ever decides to enter into the game console market is to take advantage of its position in iOS, and add gaming support to the Apple TV. The experience would likely be similar to what is currently available today when playing iOS games over AirPlay through the Apple TV. An alternate path for Apple would be to go after the console gaming market from a more OS X driven perspective. With Sony’s new PlayStation 4 costing $399, and Microsoft’s new Xbox One costing $499, the entry level Mac Mini starting at $599 is not all that far out of line. What may make this OS X path more likely to happen than the iOS path is that all of the necessary pieces to turn a Mac into a game console are already available. You just have to know where to find them. The following will look at how one can take almost any Mac and use it as a game console in their living room, today. Direct connection with HDMI – If you happen to have a more recent Mac, like the Late 2012 Mac Mini, then you may already have the necessary HDMI connection you need. The main issue is audio. Older Macs released before April 2010 may not support audio over HDMI through either its mini DisplayPort or Thunderbolt connection. Check here first and if it does support audio out, you can use either the Griffin Video Display Converter for $29 or the all in one Belkin Mini DisplayPort to HDMI Cable for $45 to connect your Mac directly to an HDTV. Wirelessly over AirPlay and Apple TV – An alternative to the direct connect method is to use an Apple TV ($99) and AirPlay mirroring over your home network. Once again, this method of connecting your Mac to your HDTV is restricted to only newer Macs. Provided your Mac was created after 2011 (check here to be sure), it may be capable of projecting its screen over the network to your Apple TV. If it can, your best bet to maximize both performance and video quality on your HDTV is to mirror your built-in display and have it configured to match the desktop size of the Apple TV. AirParrot for older Macs – The older your Mac is, the less likely it is a good candidate to become a gaming console attached to your HDTV. 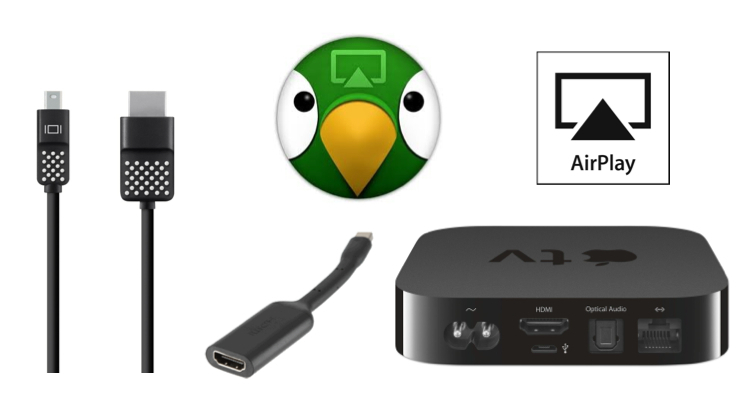 One final alternative is to use Air Squirrels’ AirParrot for $9.99 to stream your desktop to your Apple TV. Be sure to try it out with a few of favorite games first using the trial download. Like AirPlay Mirroring, you should set your desktop to match the resolution of the Apple TV to help eliminate scaling artifacts. You may also need to hard wire both your Mac and your Apple TV using an Ethernet connection to achieve better results. Bluetooth keyboard and trackpad – Regardless of how you prefer to play your games, the fact remains that you are still running OS X on a Mac. So you will need to use some sort of keyboard and pointing device at some point. Attaching an Apple Wireless Keyboard to a Magic Trackpad using either Twelve South’s Magic Wand for $30 or HengeDocks’ Clique for $25 can help. If you would rather have your keyboard and trackpad in the palm of your hand rather than sitting on your lap, consider QQ-Tech’s Mini Wireless Bluetooth Keyboard with Touchpad for $25. Sony wireless game pad and keyboard – Playing games with a trackpad may be possible, but not very practical. Fortunately Sony’s Dualshock Wireless Controller for $40 uses Bluetooth. To use this game pad on your Mac you must first ensure that Bluetooth is enabled by launching System Preferences and navigating to the Bluetooth configuration. Next you must connect the game pad to your Mac with a USB cable to enable a one time handshake. After pressing the PS button located on the game pad until the red lights flash, you should see the game pad in the list of devices that are paired with your Mac. At this point you can remove the USB cable. Sony also has a Bluetooth keyboard for $35 that attaches directly to the game pad. The trick to pair the keyboard with the Mac is to press and hold the blue button on the top left side of the keyboard before turning it on. This places the keyboard in discovery mode at which time it can be paired just like any other Bluetooth keyboard. Mapping keystrokes to game pad controls – The Joystick Mapper is available for purchase in the Mac App Store for $4.99. With it you can configure your game pad to simulate keyboard clicks and even mouse movements. It will bring game pad control to Mac games that do not already have built-in support for game pads. There is even a collection of user defined presets you can use that are designed specifically for the PS3 controller. Mac App Store – The Mac App Store is a great place to find many new game titles specifically for the Mac platform. The advantage that the Mac App Store has over some of the other stores is that many of the games offer integration to Apple’s own social gaming feature Game Center. With Game Center you can challenge your other Game Center friends, keep track of your achievements, and climb your way up the online leaderboards. Good old games (GOG) – Like the Mac App Store, GOG (gog.com) can also be used to find games and manage your library online. The advantage GOG has over some of the other online game stores is that they offer many of the retro game titles from the 1970s and 80s. GOG now has a dedicated Mac section as well as an optional client side downloader that simplifies the management of your downloaded games. Most of these retro games use a game launcher for Mac named Boxer that is based on DOSBox’s x86 emulator with DOS and are DRM-free. So it is not very likely that many of these games will be sold on the Mac App Store any time soon. 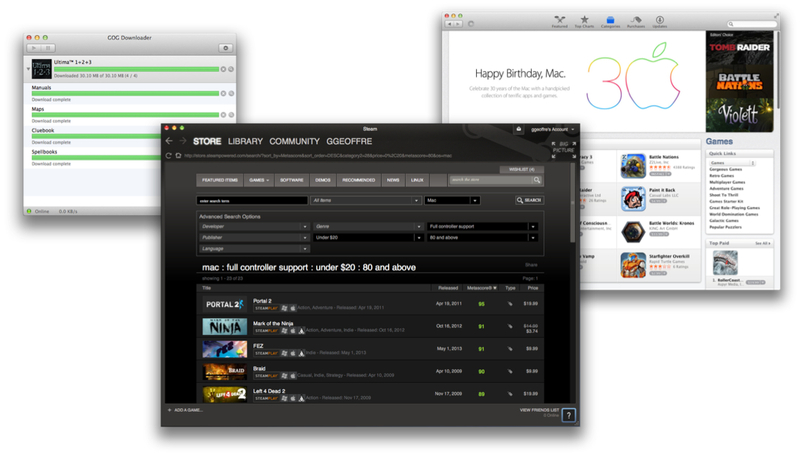 Steam – With an online gaming library, some retro games and a multiplatform social based community that you can keep tabs on from your mobile device, Steam (steampowered.com) appears to have the best aspects of both the Mac App Store and GOG. What Steam also has to offer Mac owners looking to create a gaming console is the Big Picture. Big Picture is a part of Steam’s downloadable client that makes selecting, installing, and playing games from your Steam online library simple and easy on a big screen television using your game pad. Think of it as a sort of Front Row for games. You can even surf the web with its game pad optimized browser. It really does complete the picture and make the whole console experience on a Mac much easier to manage. Amazon and origin – Deserving honorable mention from a Mac gaming console perspective are Amazon’s Digital Downloads and Origin Online’s electronic game store for Mac. While both offer downloadable titles specifically for the Mac platform, the overall experience is not quite up to par with the other three. Offering many of the same titles, the main reason to check out either of these two sites would be to get a good deal on a particular title you are interested in. Just keep in mind that the Origin store does have a limited library of games. Great article! Always happy to see others promoting Mac gaming. A bit of self promotion here, but Mac users should also checkout GameAgent.com while browsing for games. It catalogs its own games (many of them Steam-based) as well as games on the Mac App Store and Amazon. It also has a feature called Mac Match that will inform users whether or not their Macs meet individual games’ system requirements which is great for Mac users just getting into gaming (or perhaps entering the territory with the entry level Mac Mini). The site itself is run by Mac-porting house Aspyr Media (though you’ll find lots of other games published by companies other than Aspyr). Finally, if anyone’s looking to learn more about Mac gaming, GameAgent has a blog where you’ll find lots of great articles on the basics, experiments with Air Play, news, and more. Hope this all helps! The Mac Mini has some crappy Intel Integrated GPU in it. Apple needs to do better than that in order to compete with a PS4 or Xbox One. My Mac Mini has a quad-core Intel i7 2.3 GHz processor and it barely cuts it. I intend to upgrade the memory and see if it helps. Apple could have at least put some upgradeable separate GPU in the Mac Mini. It’s adequate for my purposes but jeez, Apple is always trying to cut corners whenever possible. I got the Mac Mini for its size as I use it as a media server connected to my HDTV. It seemed to fit the bill but it really should have a more powerful GPU as an option or something. Cutting corners? Mac Mini was not intended to be a gaming console. Upgrading RAM to 16GB for about $150 will make it much faster. Depending on the types of games you are looking to play, it can serve quite well in that capacity. From a specs perspective, both the Xbox One and PS4 have AMD APU (Jaguar) CPU with a Radeon 7000-series GPU and 8GB of RAM. Xbox One having the equivalent to a Radeon HD 7790 and the PS4 a HD 7870. The PS4 PS4 also uses 5500MHz GDDR5 RAM whereas the Xbox One uses 2133MHz DDR3 RAM. And to your point, the entry level Mac Mini has an Intel Core i5 with an integrated Intel HD Graphics 4000 and 4GB of of 1600MHz DDR3 RAM. Similar specs on the entry level MacBooks as well. Only the higher end MacBooks, iMacs and of course the Mac Pro have faster GPUs onboard. All specs aside, it is still a lot of fun playing the Mac version of Minecraft on a 55in HDTV. For my iPad, I tried some games – trial=free. However, after a short experience playing them, I was asked if I wanted to purchase the FULL game. Those games were removed from my iPad immediately. Wow, how interesting. Do you have any more such exciting stories available?